Last week, the six finalist teams were announced for this year’s 10th annual InVenture Prize Competition. Memeois. Computer science majors Anushk Mittal and Joshua Wang created an app that uses machine learning to generate a curated stream of memes. PedalCreator. Mechanical engineering majors Dallas Condra and Jeremy Leff worked with Industrial Design major Vanya Padmanabhan to create an affordable, customizable analog effects pedal to give guitarists better control over their instrument’s sound. pHAM. Four material science and engineering majors — Michele Lauto, Tyler Quill, Aaron Stansell and Lucas Votaw — developed a coffee filter to reduce the acidity of coffee, and plan on selling their filters to local coffee chains while broadly licensing the technology across the country. Tensionr. Five mechanical engineering majors — Michael Bailey, Austin Forgey, Hannah Larson, Lauren Perrine and Brandon Will — joined forces to develop a safe tensioning tool that uses straps instead of metal to apply tension force. Ultraview. Materials science and engineering major Kolby Hanley designed new archery grips and sights without a traditional up pin that utilize a 3D printing manufacturing process for quality, modifiable products. On Thursday, Feb. 15, the finalist teams held their first pitch practice meeting with Reaves and other staff. The groups will meet weekly to refine their pitches until the final showdown at Ferst. Besides sharpening their message, some groups will work to attract testimonials from current customers, tighten up on their businesses’ operations or file provisional patent applications to protect their inventions. Because 2018 marks the 10th year of Inventure Prize competition, the three judges this year, Jasmine Burton, Rachel Ford and Partha Unnava, are all previous InVenture Prize finalists (and in Unnava’s case, a previous judge), and know firsthand the experience of presenting their ideas to a crowd. 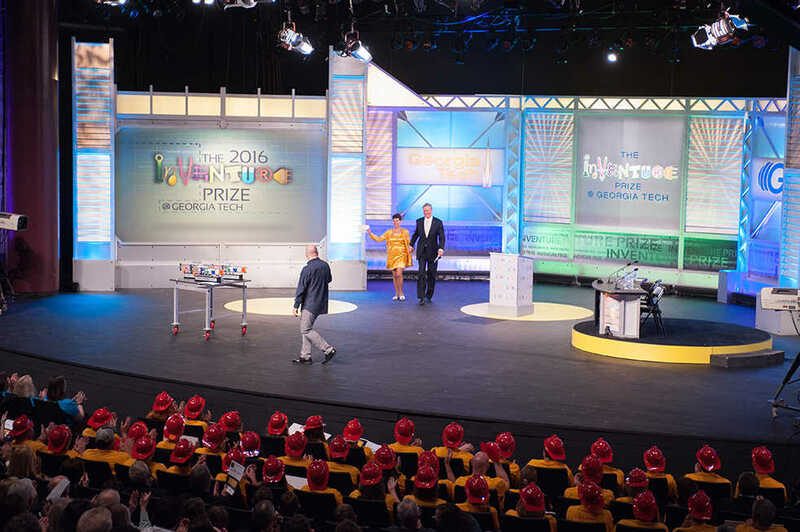 In order to watch the final round, which will occur at 7:30 p.m. Wednesday, March 14, in the Ferst Center, reserve your free tickets at inventureprize.gatech.edu. The final round can also be viewed on local television or streamed online.